Pre-release tickets which have already been purchased will be posted out early next week, and standard release tickets will go on sale on the 19th October - in physical outlets as well as online. Until then, pre-release tickets will remain available from the tickets page on the Euchronia tickets page, or from the Wildilocks webstore! Rogue will be a rather smaller scale affair than Euchronia, and will provide an introduction to the League's activities. 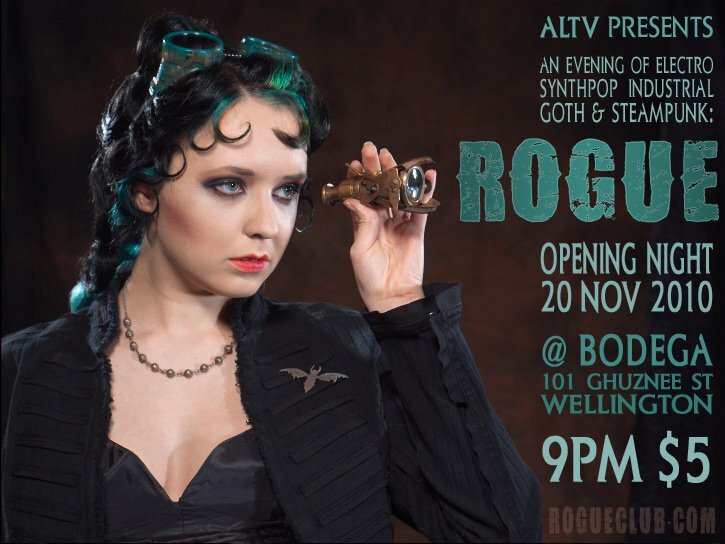 If you are in or near Wellington, enjoy musical genres such as electro, '80s, synthpop, futurepop, industrial, goth, EBM and steampunk (though of course whether this genre actually exists is a matter of some debate), and would value an opportunity to shake out your steamy, goth and industrial finery, please consider joining us for the inaugural Rogue on November 20th, 2010 at Bar Bodega, 9pm. Entry is a mere $5. Those brave souls who survive All Hallows Eve's harrowing Steampunks vs Zombies encounter might like to share their tales and display their sartorial and armourial splendour. We would certainly value the opportunity to raise a glass in your honour!